Spent some time at the building Saturday to finish up the installation of the sound system - quite enjoyed myself. As you can see from the photo the lawn has gone. It was being dug out Saturday in preparation for the car park. Yesterday, after church, we moved a bunch of stuff from where we currently meet to the new building and the gravel had already been poured (or laid... whatever) The reason for moving stuff? Yesterday was our last day in St. Joseph school. We've been there for 12 years and it's time to move on. 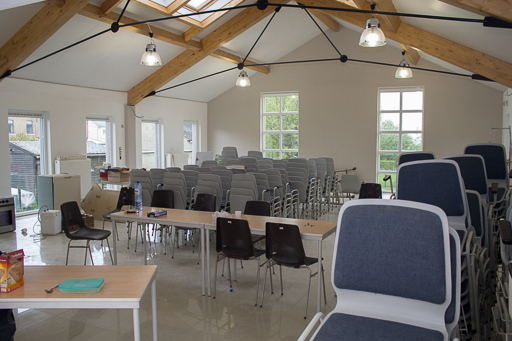 Next week, the 30th of June, we'll be having our first service in the new building! The plan to be finished by the 30th was drawn up a while ago but we didn't know whether we'd make it. The 30th is also my last Sunday as pastor of the church in Libramont as we are returning to the UK in July. I'm being replaced by Pierre who is a church member who has been doing theological studies for the last 4 years - the church is getting a real, live Belgian pastor who will be doing a 6 month 'test' from September. We're really excited that Pierre, and his wife Marianne, are going to be starting, actually, continuing, their ministry in the church in Libramont. Please pray for them. So, things are moving quickly at the building. 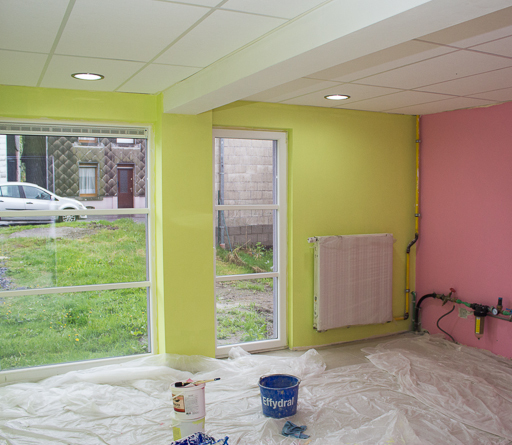 The previous two photos show the Sunday School room and the room for the little 'uns. 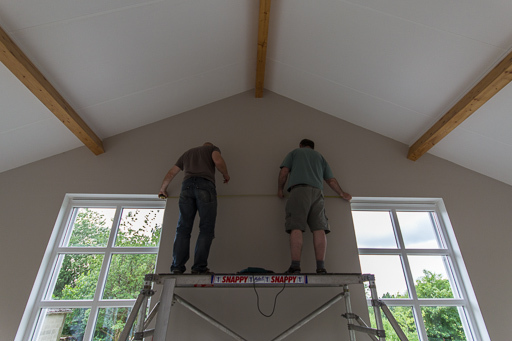 The photo to the left of this text shows Olivier and Guy putting up the projector screen. I was really helpful - I handed up the screen whilst they were on the scaffolding. Let no-one say I'm without my uses! A beauty shot of the disabled toilet. The tiling has been done (finished Sunday but I didn't have my camera) by François' dad who has done an amazing amount of work at the building for us. Finally, a view of the building from the back garden. Christian spent hours trimming and cutting and clearing in time for next week's service which, weather permitting, will be followed by a BBQ. More photos and walls of text to follow. 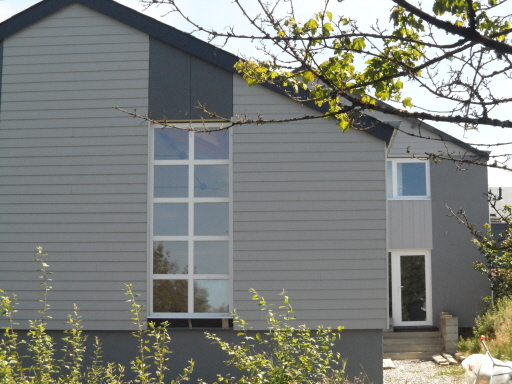 This blog is nearly at an end because our building project here in Libramont is nearly at an end. We'll archive it for posterity and a testimony to God's grace and love and his people's generosity in both time and money. 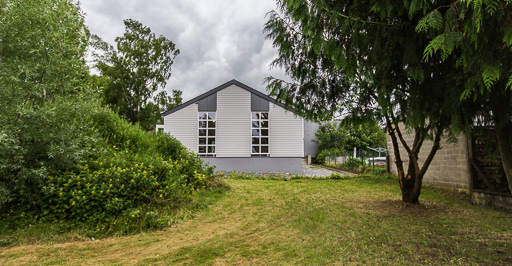 So many people have helped to make this building possible - from those who gave money to buy the old building and plot of land way back in the last century (yup, it's been going on that long) to those who have been faithfully showing up at the building over the last few months to get the work finished. The help has come from all over the world and we have been constantly amazed at how people have helped and supported us. Thank you! Although I've not updated the blog in a while that doesn't mean that nothing has been happening. In fact, it's been hard to keep up. Over the last few months there have been people working at the building at every available opportunity including weekends and holidays. Things are moving fast and so much has been finished that I don't know where to start showing what has been done. A few representative photos will have to suffice. 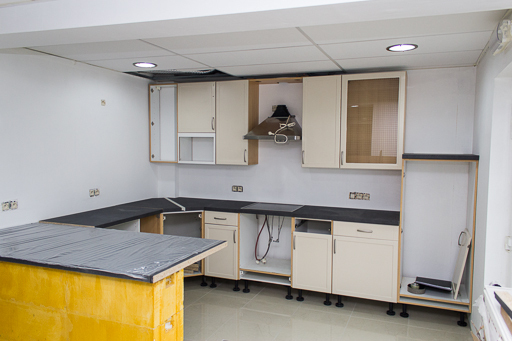 First up, the kitchen has been installed, and it looks very good. Many thanks to Sarah's family for coming to help! I mentioned ages ago that when we bought all the units we knew that they would fit with about 1cm to spare - well they fit and there is about 1cm to spare - if that. I've left out the photo where I'm reflected in the glass of the cupboard door. 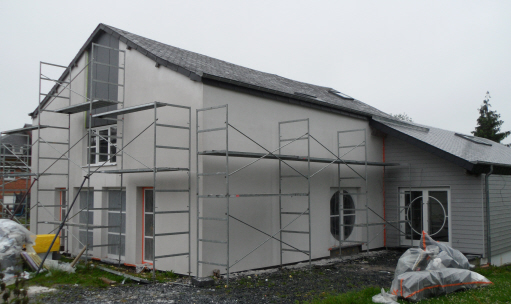 Pretty much the whole building has been painted over the last few weeks and for the most part everything is white with grey/biege highlights. But not the crêche room. As the photo shows it's bright - in fact the photo doesn't even quite do it justice. And it looks great. Rianne mentioned that she thought it was maybe a little eye watering and I suppose if you're in there for any length of time it could be overpowering but I have to say I love it. No dingy rooms here! The other room at the front of the building is going to be for the Sunday School and somebody has obviously had some ideas for how it's going to be decorated. We have some talented artists in the church who are going to be doing their thing... the kids have a hand in the plans too but no-one is telling me anything. The main hall is a bit crowded at the moment. Last week all of the chairs were brought down from upstairs in the other part of the building. Once down they were individually cleaned by the Cornette family - thank you! We're actually going to be selling on 100 chairs because we won't be needing 253 chairs anytime soon, or ever. 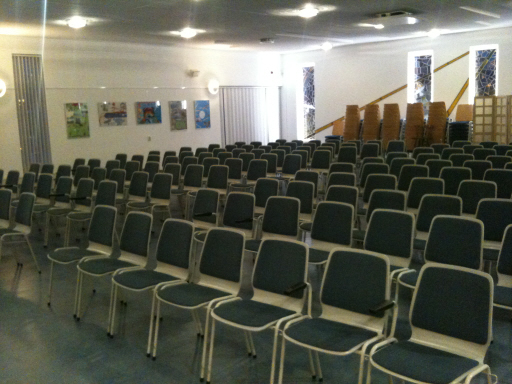 Those 100 chairs are going to going to another church which is really great news. Share the love. One thing you realise wandering around the building is that it is so light because of all of the big windows. We're going to have to put up some means of blocking at least a little of the excess light. Here Guy is noting down window measurements whilst Olivier (the photo underneath) does the measuring. Guy and Dominique know someone who makes good quality vertical blinds to measure for very reasonable prices - so we're going to at least get some quotes. I don't tend to single people out (too much) on the blog but it has to be said that Olivier, with his wife Rianne have been very much driving things over the last few months. They have been at the building every weekend and pretty much whenever they've had a spare moment. They have organised and encouraged and worked and planned and toiled. This doesn't in anyway minimise anybody else's contribution but I thought it needed to be said! Thank you Olivier and Rianne. So, we're getting there. 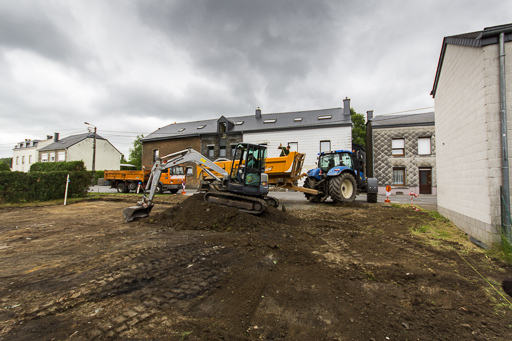 It has been amazing to see people's willingness to get involved and get their hands dirty doing all the bits of work that need doing to get us a finished church building. The building is great but you really get to see where the real church is. 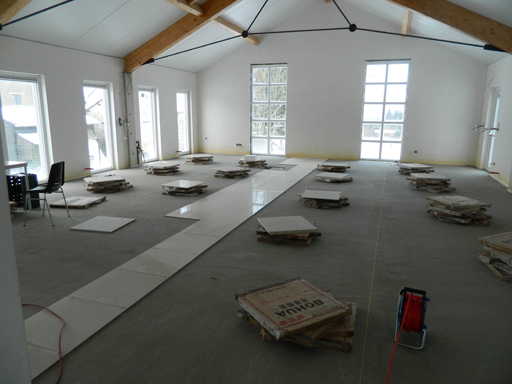 Michel and I went over to the building yesterday to visit François and his dad who were working on tiling the main hall. I took the "good" camera this time and came home with about 60 photos. I won't make you suffer them all, just a few. Because I had my tripod and remote shutter release I had the bright idea of holding everything up in the air and taking an 'elevated' shot of the main hall. It worked and I didn't drop anything. This is the corner that François and Guy, his dad, have been working on. The corner represents about one day's work and the quality is awesome. If you've seen the tiling that I did in our bathroom you'll know why we needed the experts to do this job. And François and Guy are experts, no doubt at all. 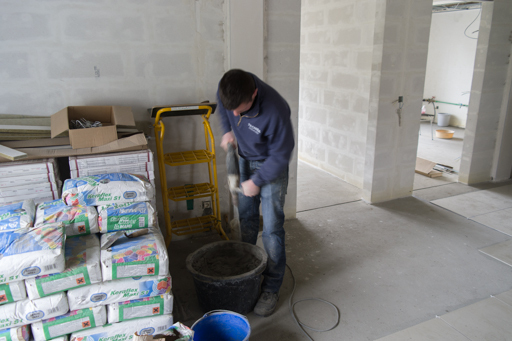 This is a shot of François mixing up the glue for the tiles. Once the glue (is that the right word?) 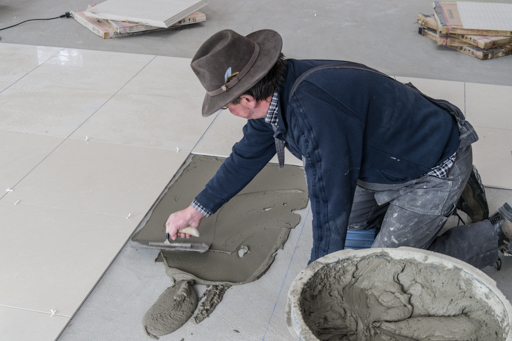 is mixed François applies a thin coating to the underside of the tile (60cm x 60cm) whilst Guy puts down a layer on the floor using a large trowel. 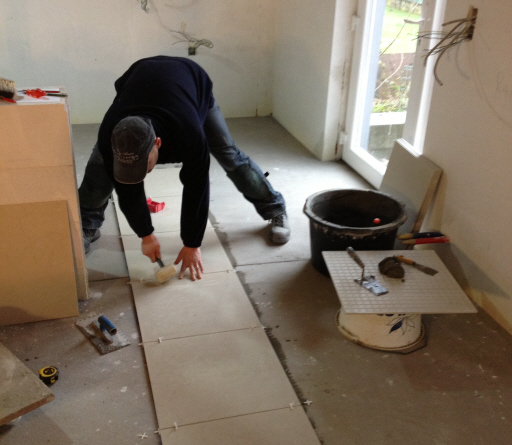 When the tile is in place Guy gently hammers it down to make sure everything is placed right and perfectly level. I think tat Michel and I could have stood watching this process all day, it's great to see professionals at work. They make it look so easy but I know that if I tried... well, let's just say no-one's going to be handing me a trowel any time soon. 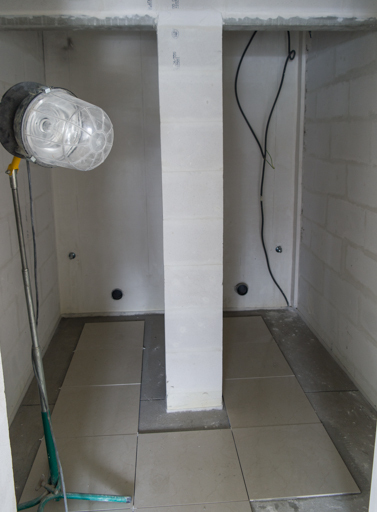 Back in the other half of the building Olivier and Rianne have been busy doing tiling too. 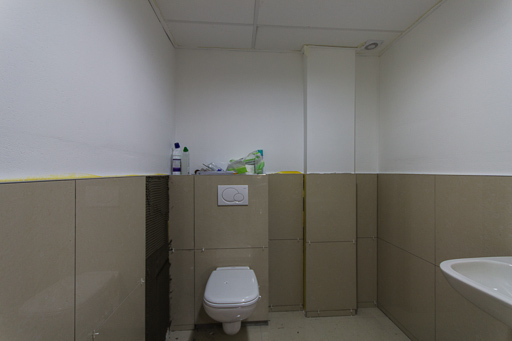 They've made a great start on the toilets and have also done more work on the tiling in the smaller hall. 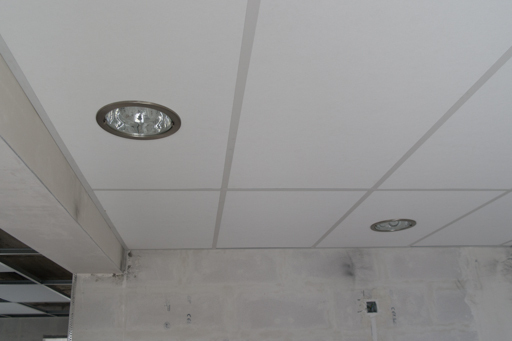 In the kitchen the lights have been fitted and all of the ceiling tiles are in place. It looks very smart! Finally an arty shot through the overhead skylight. 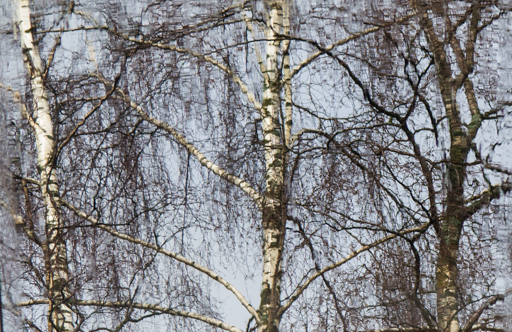 It had been raining so it makes for an abstract kind of view of the trees in the graden next door. You can see the rest of the photos (minus the out of focus ones) here, but I can't guarantee they'll be there forever - just 'til I run out of space on my Dropbox account. 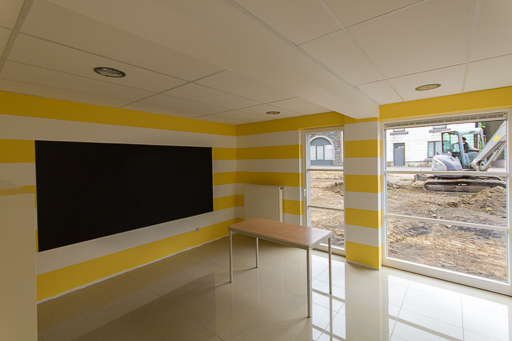 For a while now we've been asking people to donate to our building project through our 'other' website at www.1000x50.com. We've recently gone past the 30,000 Euros mark - so many many thanks to everyone who has helped us! Warning : more photos than usual! We visited the building after the service yesterday morning. Olivier, Rianne (omitted first time round - sorry Rianne!) and François have been very busy. They worked at the building on Saturday morning but I wasn't able to get over there with my good camera and forgot to take it yesterday so ended up using the one on my phone instead. Such is life, thank goodness for photo editing software. 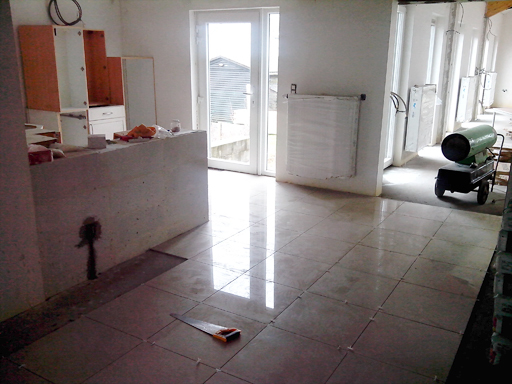 First up we have the area around the kitchen where there are now more tiles than before. We were warned not to walk on them as they were only put down on Saturday. I lost count of the number of times we told the kids to be careful. Some of the kitchen units have been brought down from upstairs. I don't now whether this photo represents there more or less final position but it's interesting to see things in place. Actually, on reflection, no-one would leave a corner unit in the middle of the floor like that... would they? 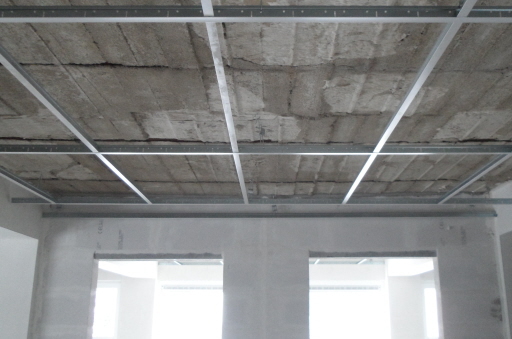 In the small hall the frames for the suspended ceiling are now finished and a few panels have been installed. 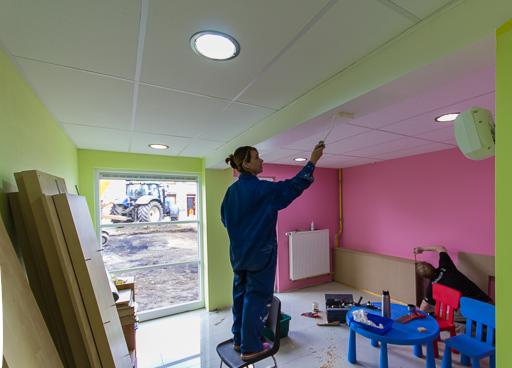 Olivier has purchased about 30 light fittings that are to be inset into the panels - which explains some of the gaps as that work hasn't been done yet. 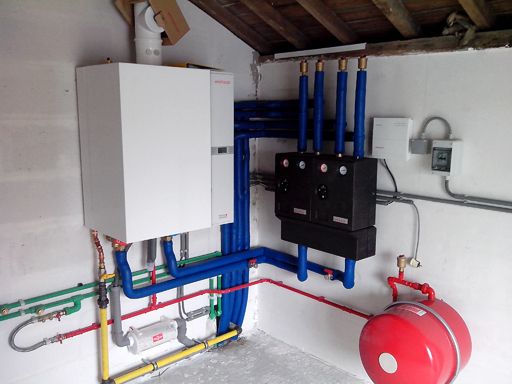 The big news is that the rest of the heating has been installed. Downstairs there are now radiators in every room. They're larger than I was expecting but that should mean no-one gets cold in the winter. When it gets down to -10°c on a Sunday morning one appreciates good heating. 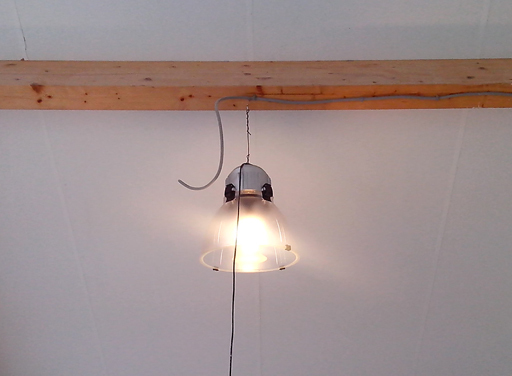 This light is on loan from a local supplier. Olivier and François installed it to give us an idea of how we could light the main hall. Eventually there will be six such lights each using a 60 watt economic bulb. Better than the 400 watt bulbs than were originally proposed. One thing we did notice yesterday was that even on a fairly gloomy day the hall is really quite bright. The lights will obviously help but we won't need them all the time. ... the heating system in all its glory. The photo doesn't do justice to just how good it all looks. Olivier commented that the installation was "display quality". I wonder if this means that the installer is going to want to show people around. I guess that could be one way to get people into the church - "Come see our heating!!" All in all François, Olivier and Rianne have made loads of progress over the last few months. 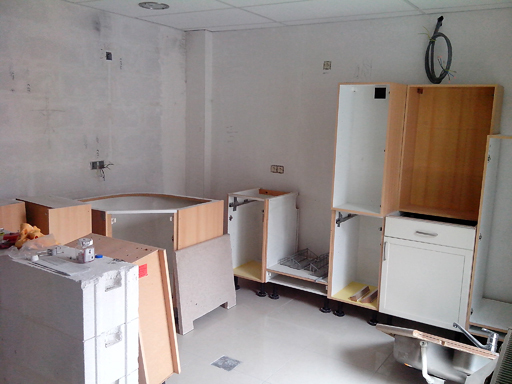 There is still quite a lot to do but it is really encouraging to see how things are moving along. 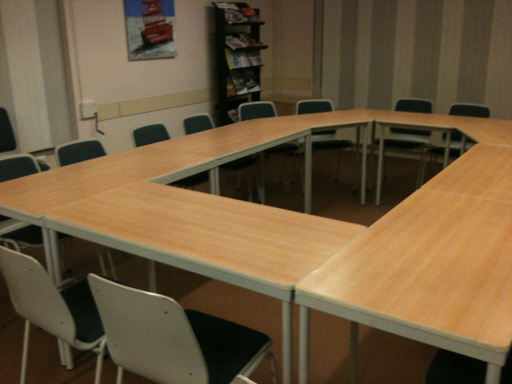 Towards the end of December a team drove to Holland to pick up the chairs that I mentioned back in November. Two large vans were hired and the trip was made to a town near Rotterdam. The team consisted of François, Guy, Olivier and Christian. When they got back to Libramont to unload there was help waiting. From left to right: Douglas, Francis, François, Guy, Olivier, Rianne, Jonathon and Christian. Manon, Olivier and Rianne's daughter is the one taking the picture. Moving onto 2013 (Happy New Year!!) 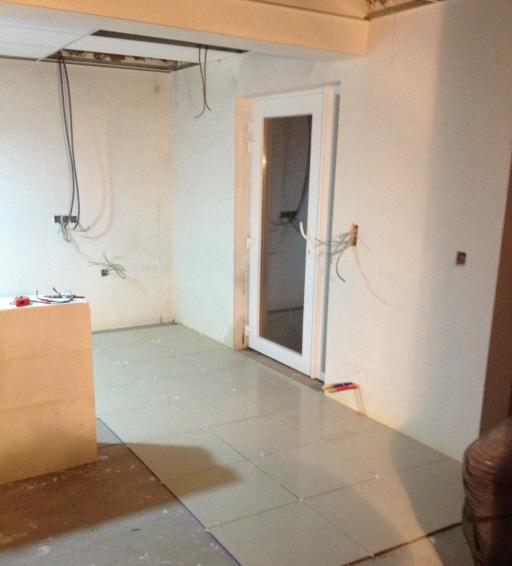 Work continues apace on the tiling. François has been very busy. The kitchen tiling is complete. 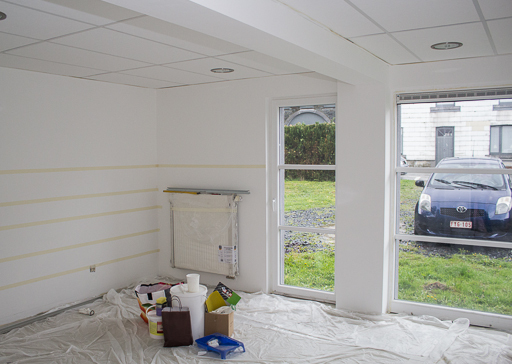 François and Christian spent this past Saturday working at the building. I was hoping to go but ended up staying home with a sick child. Michel did however visit the building and took coffee with him which was gratefuly received no doubt. 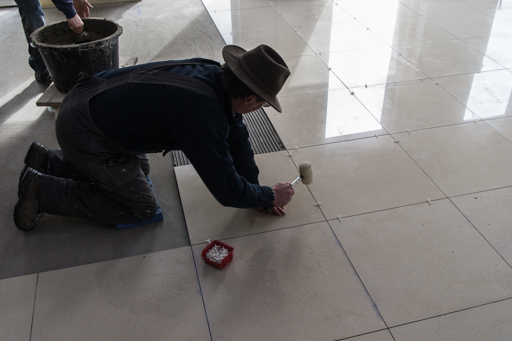 In the main hall a line of tiles has been laid which will provide a guide for all the other tiles. What this means is that, in theory, those of us who are less gifted in the area of tile laying might actually be able to help because the hard work of making sure everything is straight has already been done. Christian's van has been nicknamed "The Playmobil" but it's pretty handy for transporting loads around and Christian is always very willing to help. He also seems to be oblivious to the cold. Daytime temperatures have been around -5°c and at night time - you don't even want to think about it. 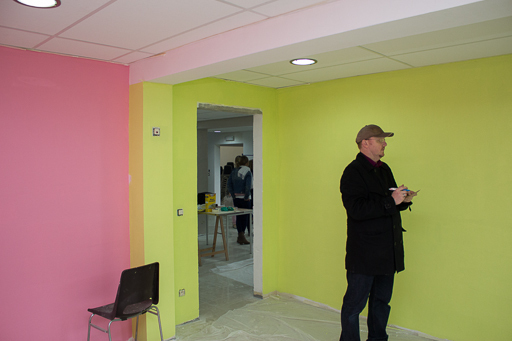 Last week François and Oivier spent a considerable amount of time working at the building. 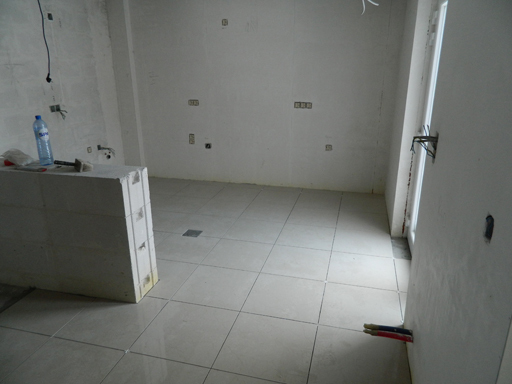 They continued the work on the ceiling and also started laying tiles in the kitchen. Since theses photos were taken they've got even more done. I'm not sure whether that's François or Olivier in the photo, either way, whoever it is is certainly hard at work. 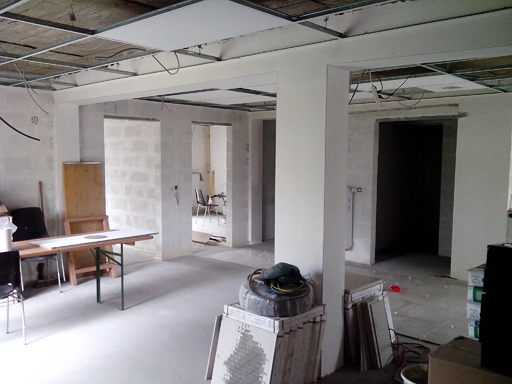 In this second photo you can see more of the ceiling and the tiles that have been put in place. The gaps are for panels that will have lights in. Olivier suggested that we recess the lights otherwise they'd be too low. Would be embarrassing to have people banging their heads on the light fittings. 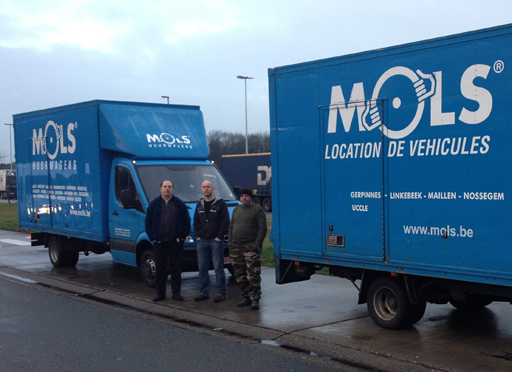 Today François and Guy are driving up to collect the chairs and the tables that we bought a couple of weeks ago. They've hired two large vans and hopefully everything will fit. Rianne (Olivier's wife) has gone to act as translator. The journey is probably going to take about 5 hours each way. They left early this morning and will, no doubt, be home late. My only job in all this is to pay the bills! Many thanks to them for giving up their day to do drive all that way, and back! Update: They're back! I wasn't 100% accurate with regards to who went. Guy and Christian went in one van whilst François and Olivier took the other. When they got back to Libramont they had help from Francis, Douglas, Jonathon, Rianne and Manon for unloading. Thank you to everyone! François is going to send me some photos soon so I'll post those when they arrive. Before going further, a correction to my last post. I said that Guy had just got his 7.5t lorry drivers licence. Guy set me straight last Sunday - he's actually had his licence since 1989, he was just letting me know he was available to help. I was out by just over 23 years... need to work on my French comprehension. Sorry Guy. Oliver and Rianne have been busy at the building over the last week or so. 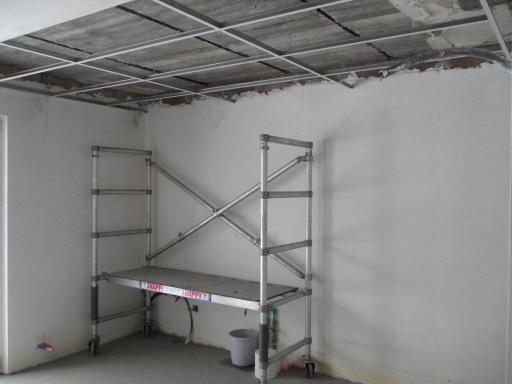 They've been putting up the framing for the suspended ceiling. 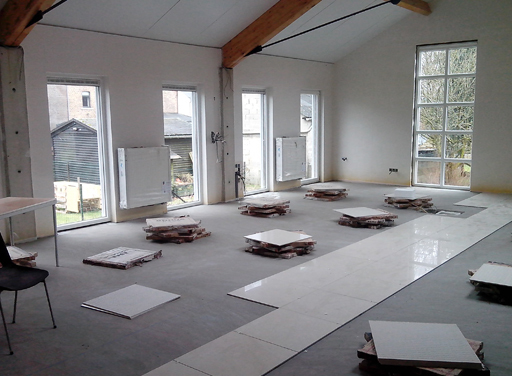 So far they have done the two front rooms and about half of the hall in the old building. It looks really nice, high quality work! A few years ago I helped put up a similar ceiling at the kid's camp at Beho. It wasn't particularly easy so I can well appreciate the amount of work that Olivier and Rianne have managed to do in such a short space of time. One thing that does become clear but isn't very evident in these photos is that the ceiling in the old building is less than level. 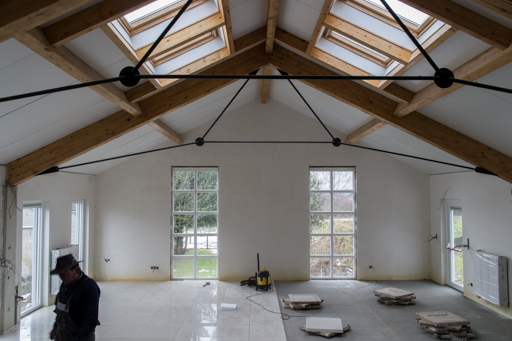 The new suspended ceiling is absolutely level - they did it using one of those new fangled laser pointer thingies - but as you can just about see in the photo the 'real' ceiling above doesn't quite follow the same line. The place that it's most obvious is if you look closely at the beams that run the length of the hall. 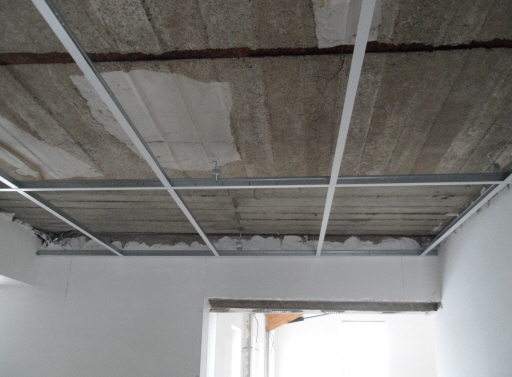 At one end there is a gap of nearly 20cm between the concrete and the frame and 10cm at the other end. Still, you have to look to notice it. Many thanks to Olivier and Rianne for their hard work! It's been a whie since my last post here. I've not really forgotten, just been a little bit busy. Some great news to share with you about how the Lord provides in sometimes unexpected ways. When we set about deciding a budget for the new church we reckoned that new chairs would cost us somewhere in the region of 10,000 Euros - the hall can hold up to 150 and we'd need chairs elsewhere too - though the kids and youth could probably just sit on the floor... That 10,000 Euros didn't include things like tables and other furniture. Well, just over a week ago I got an e-mail from Olivier and Rianne saying that they'd seen a bunch of chairs, 253 in fact, for sale via an eBay type site in Holland. 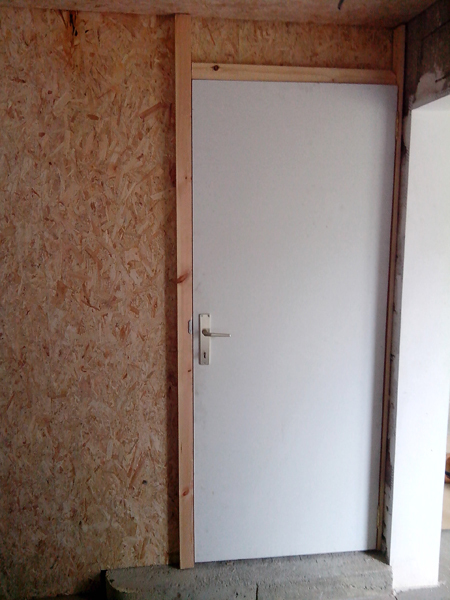 They sent me some photos and after a brief consultation with the building committee we thought it worth making a bid. They ended up making an appointment to see the vendor and travelled, with François, up to a town near Rotterdam to see the chairs. It turns out that they were being sold by a church and they were very happy to accept our offer of 1,500 Euros for the whole lot. That's the chairs on the left, in the photo. The story doesn't end there though. The people selling the chairs were so pleased that they were going to be going to another church that they 'threw in' 27 tables as well! 14 rectangular ones and 13 angled ones. All that remains is for us to transport them from Holland to Belgium and it so happens that the same day Guy told me that he'd just passed his 7.5t lorry licence. Now we need a lorry... we'll hire one I think. We had a meeting of the building committee at the building itself last night. 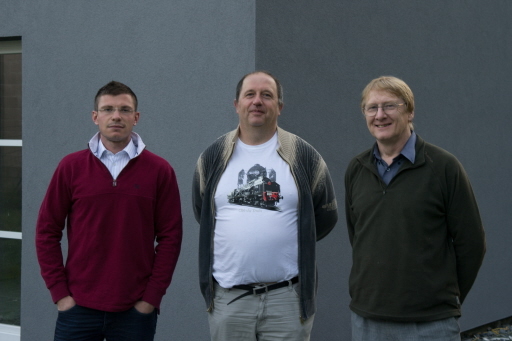 This is the building committee circa 2012 - you can see the last photo of us here. I'm not in it because I'm behind the camera this time, which is probably for the best. There were a number of things to discuss and we spent a while walking round and round looking at various bits and pieces. 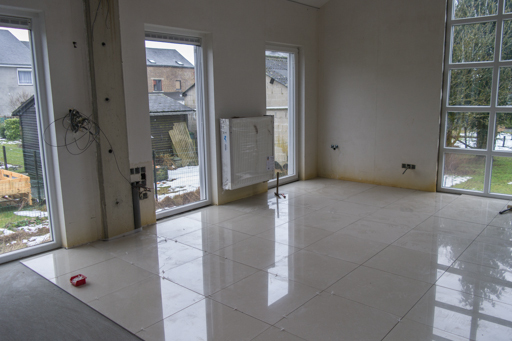 The two main things on the agenda for the coming months are the tiling of the floors and the installation of the ceilings in the old building. Once that's done we'll, hopefully, be able to get the heating installed - radiators and boiler. It was quite dark by the time we left and I travelled home the back way after dropping Keith off. 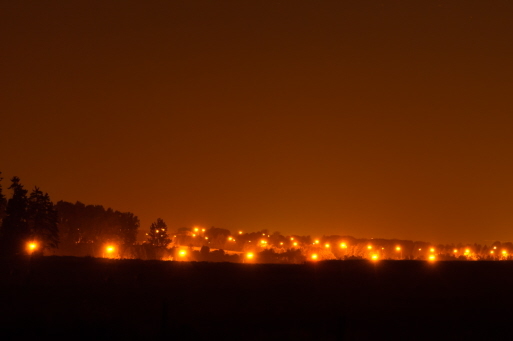 As I had my camera with me I thought I'd try a night time shot looking across to Bastogne from the fields. Voici the result. In my post from the 13th of August - the one below this one - I mentioned that we'd reached just over 14,000 Euros on our 1000x50 project. Well, less than a month later we're at a little over 28,000 Euros thanks to some very generous gifts that we've received from Belgium and the UK. A huge thank you to those who have given for our building and once again we're blown away by how the Lord provides for his church through his people. 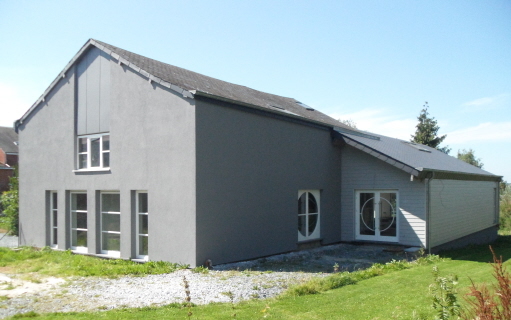 When we left for our summer holidays in early July the insulation on the old building had just been finished and the contracter had finshed applying the undercoat of rendering. When we got back it looked like this. The rendering is now finished and all the scaffolding gone. Everything looks very smart though there is still quite a lot of tidying up to do in the coming weeks. 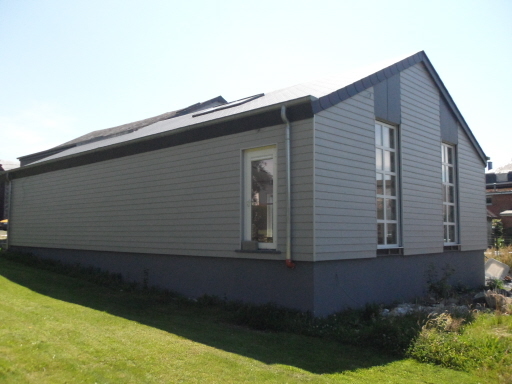 As well as finishing off the old building the contracter has added rendering to the side of the new building that covers up the breeze blocks. Again, a very neat and tidy job. As you can see the grass has also been cut - many thanks to Alain for his hard work. When I took this shot I didn't actually notice at the time, but the rendering goes all the way round to the back of the old building - you can see it on the far right of the photo. As well as news of the building I'm also really happy to report that the 1000x50 project is producing fruit. The grand total of gifts received over the last few months is now at 14,513 Euros. A huge thank you to everyone who has given. We're constantly amazed at people's generosity and God's provision.